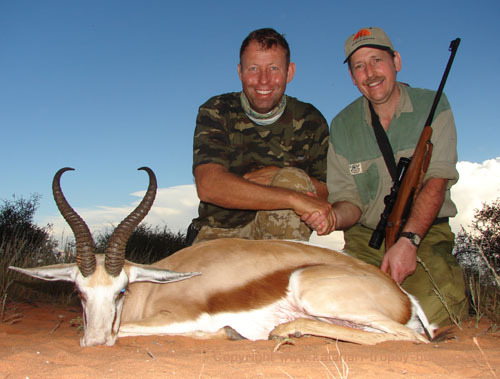 For Your Enjoyment..."Africa no place for sissies"
Picture top right: Ulrich Langley with a Springbok he hunted here in the Kalahari. What an exceptional pronk-picture this is! We welcome all the new subscribers to our Newsletter. May the Kalahari Hunting News be interesting and enlightning to you. We also apologize for missing the March issue of our Newsletter. In the last couple of months we've had a lot of problems with our internet connection. Most days we couldn't go on the internet. This made working on our website and Newsletter very difficult. During this time we've also done some renovation at our hunters'camp. We now have an inside-barbecue area for the cold winter evenings. However, we still enjoy long hours of sharing hunting stories and - experiences at the outside firepit. How can one not have a good time under the clear, bright starry nights? We plan to send out shorter, but more frequent Newsletters. We have just too many pictures to share and since we can only include a limited amount of pictures per issue, we need to send them out more frequently. 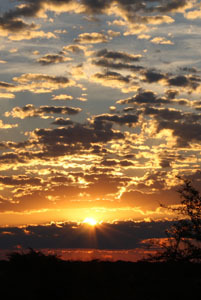 May you, as outdoorspeople and hunters, enjoy these news from the Kalahari. Although we've had a warm Autumn until now, the cooler weather arrived as if overnight and we are enjoying the first signs of approaching winter. 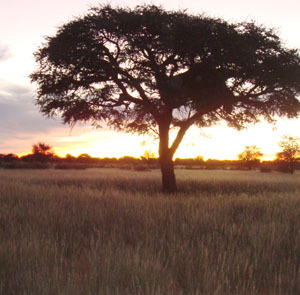 This is always a special time in the Kalahari because our summers here are mostly very hot. The fine weather of Autumn are welcomed by man and beasts here. This year we have so much to be thankful for. We received exceptionally good rain. Many parts of our region only got patchy showers and those farmers may not have enough grass to sustain the animals for the rest of the year. This often happens in the Kalahari where our average rainfall is ± 10 inches (250 mm) per year. On Uitspan Ranch, we have a lot of grass for the year to come. The animals are in excellent condition. What a blessing from our Creator! We received more good rain showers just two weeks ago. Rain this late in our season, ensures good growth also in our Springtime (September). The Kalahari Truffle (formerly Terfezia pfeilii, now known as Kalaharituber pfeilii), or !naba by the San, is a naturally occurring desert truffle and cannot be sown or cultivated. Truffles appear erratically, about once every four or more years, between April and May, depending on the rains. The truffle season is brief, lasting only until the first frost. Since we've had such good rains in this part of the Kalahari this year, the !naba harvest seems promising. We love to go "hunt for !nabas". It is always quite an adventure as the !nabas grow beneath the ground, hidden by sand and long grass, and only betray their presence by a small crack in the ground. Last year when Gert and Hennie from Netherlands (see the picture) were hunting with us, they were lucky enough to taste this speciality. 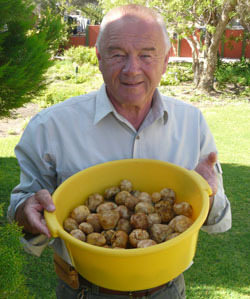 Karen Eaton from Washington, USA, experienced such a truffle-hunt here on Uitspan. Click here to read Karen's story. While we are working on this Newsletter, there are millions of people affected by recent events in nature. The ash of the Iceland volcano brought airports to a standstill. Haiti and China experienced devastating earthquakes. Nature is definately not in the hands of mankind. Nobody can deny that. God's Ways: "When the methods of Providence are dark and intricate, and we are quite at a loss what God is about to do with us - His way is in the sea, and His path in the great waters, and His footsteps are not known... - a meek and quiet spirit acquiesces in an assurance that all things shall work together for good to us, if we love God, though we cannot apprehend how or which way. It teaches us to follow God with an implicit faith, as Abraham did when he went out, not knowing whither he went, but knowing very well Whom he followed. It quiets us with this, that though what He doeth we know not now, yet we shall know hereafter (John 13:7). When poor Job was brought to that dismal plunge, that he could no way trace the footsteps of divine Providence, but was almost lost in the labyrinth (Job 23:8,9), how quietly does he sit down with this thought: "But he knoweth the way that I take: when he hath tried me, I shall come forth as gold." During December Hendrik had a great loss of livestock on the farm. This was due to some unforseen circumstances in nature. We had exceptionally warm temperatures during December. We always check the level of water troughs every second or third day to make sure water doesn't leak out or get clogged in the pipe-lines. The animals need a lot of water in such high temperatures. One day when Hendrik drove up to a certain watering point, he found a lot of dead sheep and many more very sick ones. After some investigation, it became clear that the culprits are... White-backed Vultures. The extremely hot weather caused the vultures to go drink and bath themselves in Hendrik's water trough. Vultures' stomach acid is so powerful because it has to break down meat quickly. Vultures often vomit as a form of self-defense or for a quicker take-off. They also urinate to cool off. This vomit and urine are poisenous for some other animals. Both the vultures and the sheep went to drink water more often during those days. The sheep were poisoned by the water where-in the vultures bathed, vomited and urinated. Hendrik lost 130 gravid stud ewes. It was a terrible loss. But there was nothing to prevent this. Another case where this happened with dogs, is described on this webpage. "The gigantic Camelthorn tree (or as called in Afrikaans the Kameeldoring) is a dominant tree in the Kalahari and can become 15 meters high. Animals love to eat the pods and also rely on this huge tree for shade and homes. 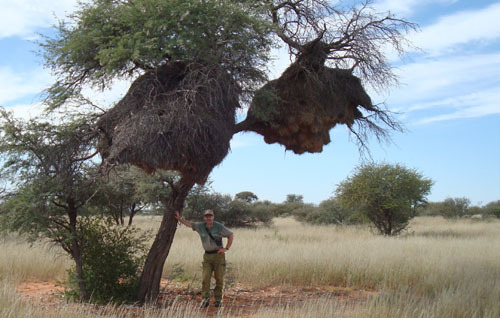 The nests of the Sociable Weavers, for example, are often seen in Camel thorn trees. Their seed pods are a great source of food for all animals. It's also very rich in protein that are good for them. The pods drop to the ground during the winter which is a bad time for the animals because food is short. The protecting layer which the pods has, makes it almost impossible to break open. However, when animals such as the Gemsbok, Eland or Springbok swallows a pod, the juices in the animal's stomach soften the pod's hard outside and the contents are digested. Nonetheless, the seeds don’t get softened and digested. In return for the food, the animals distribute the seed through their dung for a new tree to grow. We thank God for this "Tree of Life" here in the Kalahari! 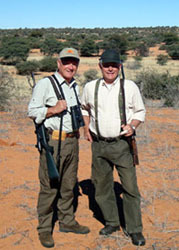 Jaco Louw and his friend Riaan from South Africa, hunted Zebra, Red Hartebeest and Warthog with us in August last year. 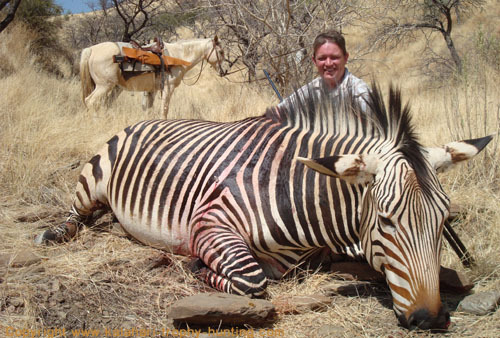 We haven't included any of their hunt's pictures yet and would like to share the picture of this exceptional big Zebra with you. Jaco worked hard for this animal and was quite exhausted when he got it. 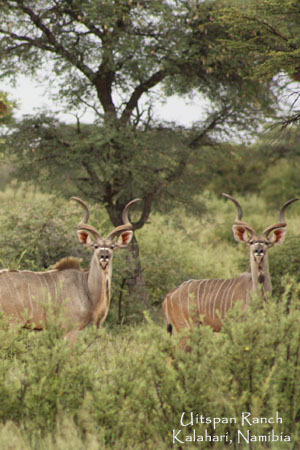 We hunt Hartmann's Zebras in the Khomas Hochland mountains near Windhoek because this is the natural habitat of these animals. This hunt was also conducted on horse-back... a unique experience. "I did it at last. I shot my very first animal, which I wanted to do for a very long time. It was one nice evening when I was sitting doing my homework, (I do homeschooling) when my mother came in and said, "Come on, Dad wants you to go hunting with him." I almost jumped through the window of enthusiasm. From the time that Dad taught me how to use the gun, I wanted to shoot, especially with the .243. Jan-Hendrik, my brother, shot several small animals and (I have to admit it) I was green-eyed. Seeing how much Jan-Hendrik enjoyed it, I wished to also experience hunting an animal. 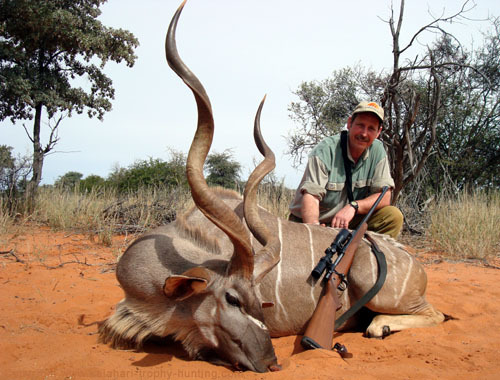 Now Dad satisfied me by giving me the opportunity to shoot… a kudu! 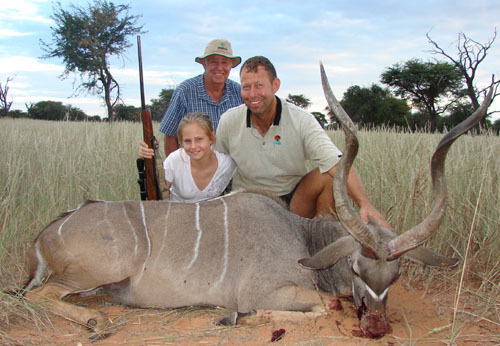 I guess everybody knows that a child of 11 does not usually get the opportunity to shoot a kudu for a very first buck! I am very grateful to my father and grandfather. Grandpa Hendrik did the driving and, as the hunters that experienced it know, with him at the wheel you are almost guaranteed to have a fast and bumpy ride. Nevertheless, it was LOTS of fun and exhilaration. Thank you everyone, Dad, Grandpa and Mom for making my dream come true: Dad for giving me the opportunity to shoot my first animal; Grandpa for driving and mom for taking the pictures and videos." In March this year, Roy Langley, his wife Denise and children Ulrich, Bronwyn and Carl-Heinz hunted for the second time with us. We first went all together to the Namibian coast for a fishing trip and then came here to the Kalahari to hunt with them. We had a wonderful time together. 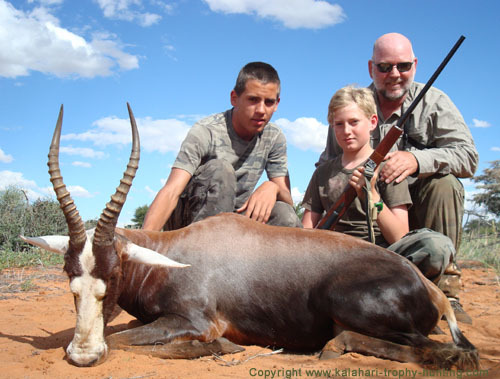 You can see some of this trip's pictures also on "Uitspan Hunting"'s page on Facebook. 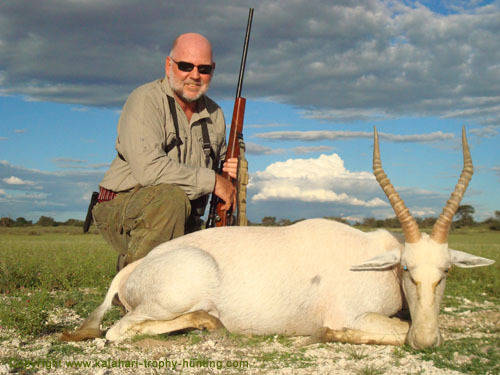 Above: Roy got a very good White Blesbok. This specific colour Blesbok is produced by selective breeding. 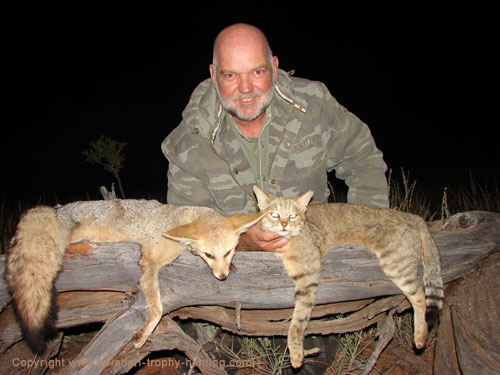 Above: Roy hunted this Cape Fox and African Wild Cat with a special permit. Both these animals are common residents of the Kalahari. 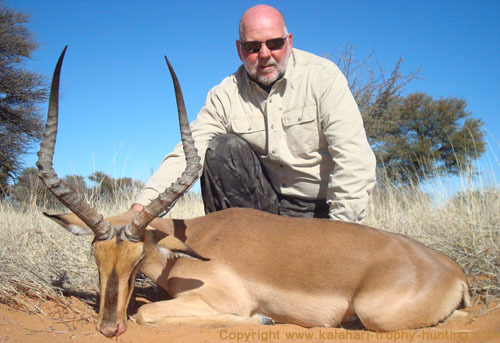 Above: Roy hunted this good Black-faced Impala trophy in July last year. 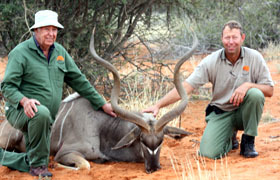 Above: Carl-Heinz got his Blesbok trophy. Above: Ulrich worked hard for this Gemsbok trophy. This will make the hunt all the more memorable. See more of the Langley's pictures here. Above: Christiaan got this beautiful Springbok trophy. 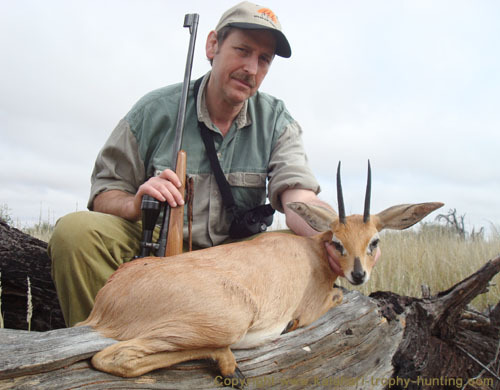 Above: Christiaan with a very nice Steenbok. Above: Christiaan had to keep this Camel thorn tree upright ;o). 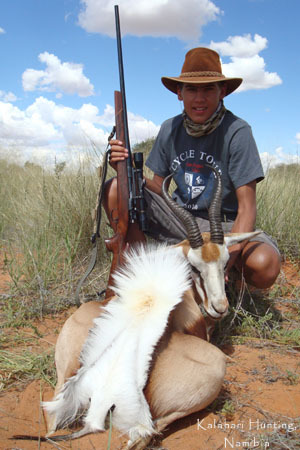 See more of Christiaan's Kalahari hunting pictures here. 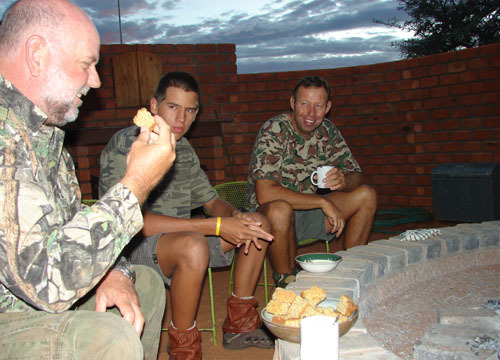 Christiaan's hunt was followed by 3 hunters from Qatar. They hunted a "Management Hunting package", which is intended to do also a bit of culling in the herds. We had a hectic week. We will publish Turki, Mohammed and Ahmed's pictures in our next issue. What wisdom our covenant God reveals even in the colors which He chose for His earthly creatures! How soothing for the eye is the green grass, when the bright summer sunshine comes down upon it on a cloudless summer day! How much does the pure white snow lighten up the earth on those cloudy winter days, when the sun strikes the earth from a greater angle, and does not have the brilliancy and warmth it has on a summer's day! But try to realize what life would be like had God chosen to have pure white grass with the summer's bright light falling upon it. Even now we find it necessary to wear sunglasses. What if the snow flakes on a cloudy day would be green instead of white? Ye fire and hail, ye rain and snow." Now these creatures, of course, have no tongues where with to praise God. They do not even know that He exists. But God made man in His own image as a thinking, willing creature with a tongue and voice, so he could praise God, that is, extol Him for His virtues; and the point is that only those who can praise Him for His love, mercy, and grace in Christ can and will praise Him as their Creator. God must in Christ be our Savior if we are going to praise Him as our Creator. We must see Him in the wisdom and power of our salvation, if we are going to praise Him for these in all His works in creation. We who see and know Him as our Savior in Christ are by Him made able to praise Him as our Creator. Do not then find fault with Him for rain, snow, and stormy winds, but praise Him as the God of wisdom and power. 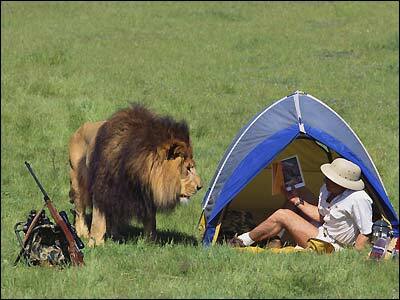 For Your Enjoyment: "Africa no place for sissies"
And no... this picture was not taken on Uitspan Ranch ;o).